This article explains the communication model by Albert Mehrabian in a practical way. After reading you will understand the basics of this powerful communication skills tool. We communicate globally with one another by means of language, gestures, signs and pictograms. It is almost impossible not to communicate. To get a better understanding of communication, professor of psychology Albert Mehrabian studied the importance of non-verbal communication in the 1970s. The influence of non-verbal communication is stronger than was first assumed. Albert Mehrabian studied the effects of conflicting messages. How come that someone who is stamping their feet while yelling ‘I’m not angry’, does not come across as credible? 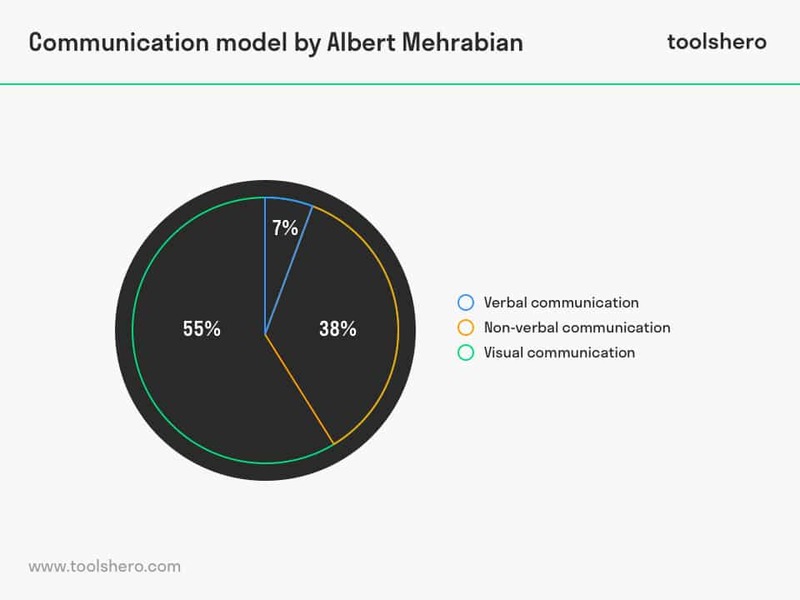 That is why Albert Mehrabian developed a communication model, in which he demonstrated that only 7% of what we communicate consists of the literal content of the message. The use of one’s voice, such as tone, intonation and volume, take up 38% and as much as 55% of communication consists of body language. This 7 – 38 – 55 -model is still much used today. But how can it be explained that a person actually listens to only 7% of the substantive message? This is to do with natural instinct. The first human had an undeveloped voice and was dependent on non-verbal communication and the utterance of sounds. This is why non-verbal communication is deeply rooted in the brain and we still use this primarily every day. That which is literally being said. The spoken word is part of the verbal communication in this and the intonation and body language are both part of the non-verbal communication. How something is said (use of voice). Intonation is the vocal factor and body language the vocal factor. Which posture, facial expressions and gestures someone uses. The non-verbal elements in the communication model show a person’s feelings and opinions. When someone says something, their body language and intonation could be dominant, as a result of which there is no agreement between what they say and what they radiate. It is a myth that we can communicate globally with people with a different language background just by using non-verbal communication. It is about the interaction, in which the non-verbal elements could be dominant. Apart from interaction, communication is also about the fact that the verbal and non-verbal elements support one another and that these are congruent. What someone says will then be more powerful and convincing because of their gestures and intonation. The message will absolutely be more unconvincing when there is no congruence and the receiver could be set on the wrong track. They will unconsciously focus more on the non-verbal elements that will always dominate collectively. What do you think? How do you communicate verbally, vocally and visually? Do you recognize the numbers within the Communication model of Albert Mehrabian? Do you recognize the practical explanation or do you have more suggestions? What are your success factors for good and clean communication? Mehrabian, A. (1981). Silent Messages: Implicit Communication of Emotions and Attitudes. Wadsworth. Mehrabian, A. (1972). Non verbal Communication. Aldine-Atherton. I completely agree with the 7-38-55 Model…. Even though verbal communication has been used well… I have learnt something interesting that our brains still heavily rely on our senses to decode the full information to get meaning…Seems as though we put so much effort on the verbal aspects of communication that we forget to really emphasize on the significance of also portraying yourself in a way that your non-verbals go hand in hand with the communication you give verbally. The types of communications are the models we use in our day to day lives. Very informative. I think everyone who reads this also needs to do a bit of research as to how applicable the 7% 38% 55% ratio is to general communication and the real world. From the quick background checks I have made on the internet it seems Professor Mehrabian himself has tried to make people aware of the limitations of his two studies and he never intended that his results should be misinterpreted and then be applied to everyday forms of communication. His studies only looked at a very narrow, specific form of communication and focuses on feelings. His ratio has never been proven, it was only a suggestion put forward and the methodology of the experiments is also open to criticism as is the combining of the results of two separate studies to produce the ratio formula. I suspect that the irony of the misinterpretation and the subsequent miscommunication is not lost on Professor Mehrabian. Interesting article about Professor Mehrabians study; my reading is that it only really holds true when the message being communicated is ambiguous and therefore some of examples hold true and others that I have seen do not. I think that if we link this with our knowledge of the people we are dealing with, either through our well tuned intuition or a formal assessment then we not only understand when people act out of character, but we also get to read their responses differently. Actually the good doctors work is based on an agreement gaining presentation. In other words, your ‘selling’ them on something. Selling is nothing more than gaining agreement from someone to buy your product, service, hand in marriage, belief in God- or whatever else you are selling. This is not the magical pill,However, it allows for some categorization. It gives one a chance to make a conscious effort to connect with someone. If you study Neuro Linguistic Programming, this supports the structure of the human experience as visual, auditory and kinestetic. The brain is a sensory based organism as supported by Dr. Howard Gardner and his study of Multiple Intelligences, as well as Dr. Milton Erickson and Virginia Satir (NLP) and is also supported by Dr. Eric Berne and his work in Transactional Analysis. None of these mentioned are connected, or supportive of the others- to my understanding. Yet, in my 25 years of change work, they all support the same hypothesis! We live in a bitter, hateful world, where many need to make others wrong, in order to be right. Just like some of the comments, how this isn’t appropriate, or it is not all inclusive. Nothing is! This is good information for anybody who wants to work to connect with other people and get off the hate mill. We live in a time where we condemn everybody else’ hatred, but condone our own. We are so smart, and feel the need to prove how superior we are to others. This is good info for those of you who truly want to be better communicators and make a valiant effort to do something different!